Like many of you, I have a lot of students with expanding expression goals. I love working with these students in a group for the great peer model they get, as well as the great conversational structure. Recently, I've been having my students answer questions to expand their answers - like so many of us do in therapy. I realized that my kiddos need a visual, something they can follow. 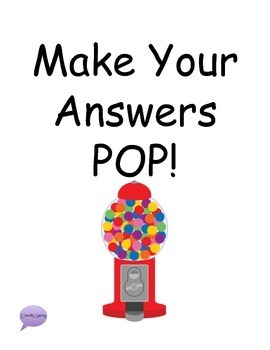 So, I created "Make Your Answers POP" using candy as my inspiration LOL. I'm using this in two ways - I printed two copies, one to put up on my wall, and one to glue to popsicle sticks. I'm going to have my students answer questions and identify parts of an answer using the makeshift signs. If I need to give a visual cue to dig deeper, I'm holding up a sign, or pointing to the sign on the wall. I'm hoping that eventually my students will cue themselves with the sign on the wall. In the meantime, popsicle sticks all around! You can download this FREEBIE activity here on TpT.